When the yet-to-be daughter ignored the humbug about forty weeks then disregarded the day after the due date then snubbed another day and another and another, the almost-mother, a potter by profession, couldn’t sustain her suspense. She didn’t exactly lose interest in this prologue but turned prosaic, figured the child would come when she came and, if the lateness lingered too long, knew the doctor would induce labor. Her thoughts instead swung to the studio where, in anticipation of a newborn, she’d already wrapped up her summertime throwing and gotten as far as bisque-firing the greenware. The shelves and work counter were lined with the fleshy pink of half-baked pots. These porous bowls, cups, colanders, and pitchers still needed glazes and a hotter firing to finish them. With the baby a week overdue and apparently in no hurry, the potter eyed the waiting pots with renewed interest. She’d made her peace with leaving them undone. She never anticipated this bonus of unfettered time. So though the supper hour had long since passed and though usually, by this time in the evening, she was in bed beside Michael, her head propped with pillows, her swollen feet also propped with pillows, and her book propped on a stomach that undulated with her child’s slow turns; the potter decided to stay in the studio. She tied back her hair and began the homestretch of the pot-making process, brushing wax on the pots’ feet, stirring vats of glazes, dipping, pouring, and overlapping her favorite combinations then swiping clean the residue that beaded on the waxed bottoms. 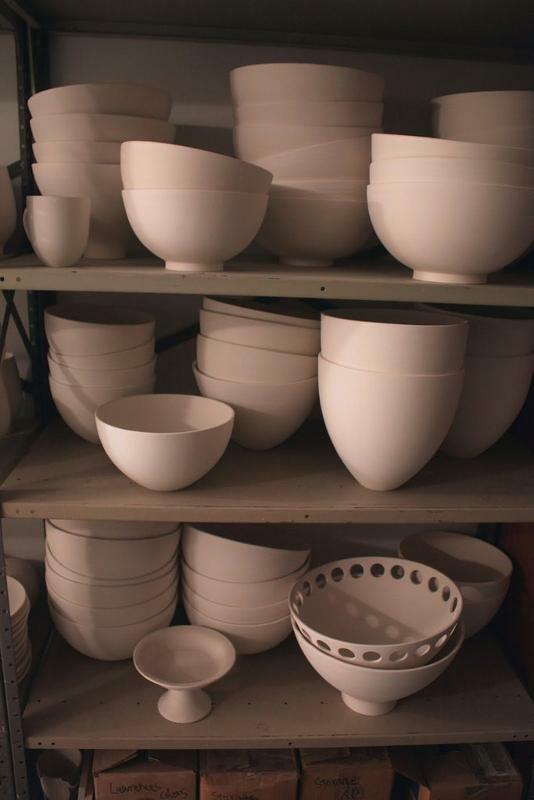 She dragged fifty-pound glaze buckets across the studio’s cement floor, hauled heavy shelves into her kiln, bent, heaved, and hefted with indefatigable determination, for the first time in months, not feeling her aching back, not noticing her sore feet, not even paying attention to the hour. Her husband checked on her at two in the morning, but she couldn’t talk. She was busy. She had to finish. She would finish. Finally, filthy and panting from exertion, she situated the last pot on the shelf, closed the cover, and started the fan and kiln. She hauled the glaze buckets to their corner, washed the floor and counters, and turned off the studio lights. At last, she returned to the dawn-grayed house for her shower. As the water coursed her clean, her stomach started with a seizing grip. Now, now that she was weak and drunkenly clumsy with sleeplessness, the child had decided to be ready. Let the mother from the onset learn what it means to wait. To wait then to rush. Let her understand the quagmire of exhaustion. Let her, from this moment on, know profound anxiety. Yes, let her discover suspense is, indeed, sustainable. And watch how—compared to the child, pinkly naked and diminutively perfect—everything else becomes secondary: an unattended, half-done, shelved world. This entry was posted in Issue 16:1 and tagged Flash, Melissa Ostrom by TC Editors. Bookmark the permalink.